What convinced this reporter that Scotty was not just another Josh Turner wannabe & what has Scotty done on his debut album to show America that he is not just another JT wannabe. This is actually a very good interview - some questions are the same but there are some new ones as well. 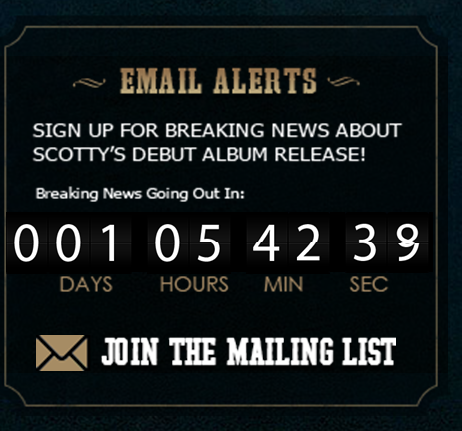 This is on Scotty's official website .... 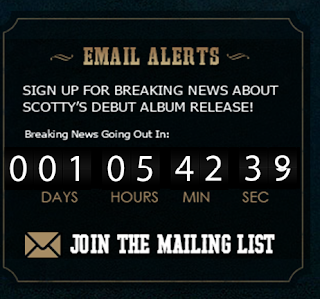 So, apparently Thursday at about 6pm EST we are going to get some BREAKING SCOTTY NEWS. According to the site, it appears to be album related. We know that it's due out in Oct, we know it can be pre-ordered, 0---o What else is there to know at this time. I DON'T LIKE WAITING MR. AMERICAN IDOL >-< . Any thoughts on what it could be? Maybe he's going to explain the facial hair is for the album release, maybe they're going to tell us he and Lauren have decided to create a co-album and there won't be a solo album.. HAHAHA OMGOSHH I HATE NOT KNOWINGGGGGGGGGGG.. Any thoughts?? Scotty & Thia took time to visit the Ronald McDonald House while in Columbus, Ohio. Follow the link to view a video and read the printed story. There is another link once your on the site that will take you to pictures of their visit.